Those gathered for the University of Maine at Presque Isle’s 107th Commencement Exercises on Saturday morning became witnesses to a very special moment for two UMPI students when Timothy Babine, member of the graduating Class of 2016, had an important question to ask Fine Art major Hayley Hamilton. Having accomplished two very big goals—completing his degree at UMPI and being accepted to his top graduate program choice, Marshall University’s Master’s Program in Exercise Science—he said he had just one more thing he wanted to do. He then strode off the stage and down the aisle toward Hamilton and got down on one knee. Speechless and with her hands over her mouth in surprise, Hamilton shook her head yes and Babine placed an engagement ring on her finger, to the cheers of the crowd. Those who have attended University graduation ceremonies for the last quarter century say they believe this is a very first for UMPI. Turns out, Babine had asked the President for special permission to make his very public proposal, and his family members were in on the secret. Not Hayley, though. 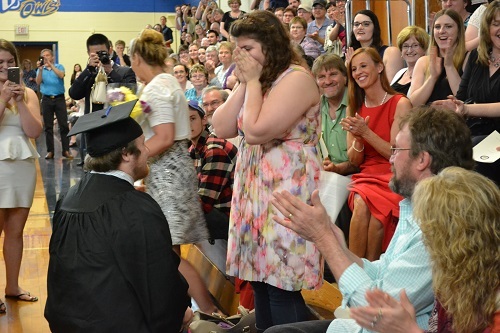 As people filed out of Wieden Gymnasium after the graduation ceremony, she was still stunned and said that, while they’d talked about an engagement someday, the expectation is that it wouldn’t happen until Babine was done with graduate school. 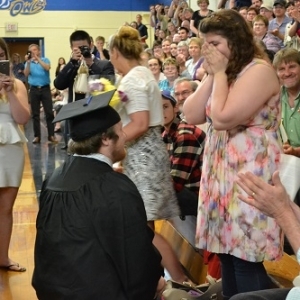 For the couple and their family and friends, it was the perfect ending to a graduation that they’ll certainly never forget. And because the event was live streamed, and has been posted as a video on the UMPI youtube page, anyone can take part in this special moment with the couple. To view the proposal, visit https://youtu.be/vIOamdIETqE. The proposal appears about 1:39:30 into the video. This story has since been covered by media outlets nationwide. To view some of those stories, see the links below.